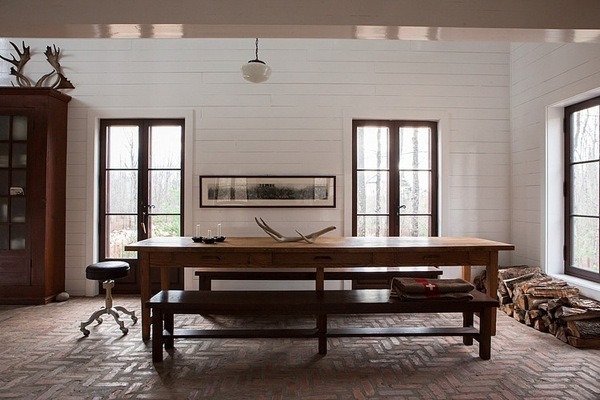 This is the home of photographer Jean Longpre and Rosalie Clermont, designed by Longpre. It is located in a small town called Fitch Bay in Quebec, Canada, about two hours from Montreal. 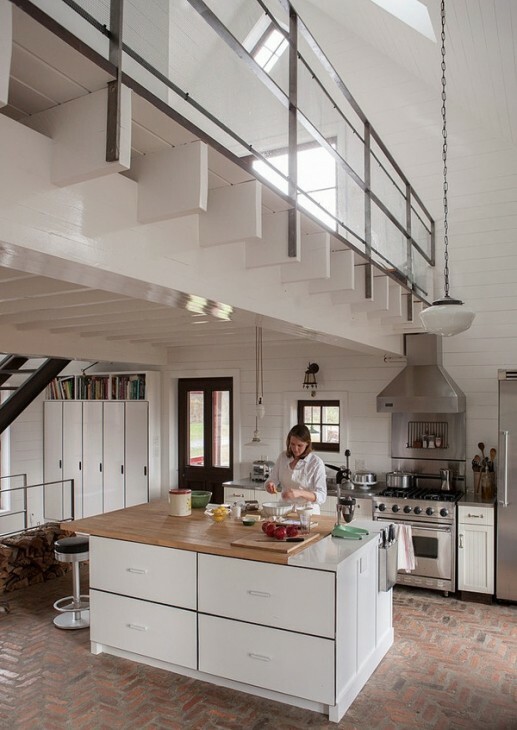 I found it interesting because it combined a modern industrial approach to achieve a cozy and interesting home. 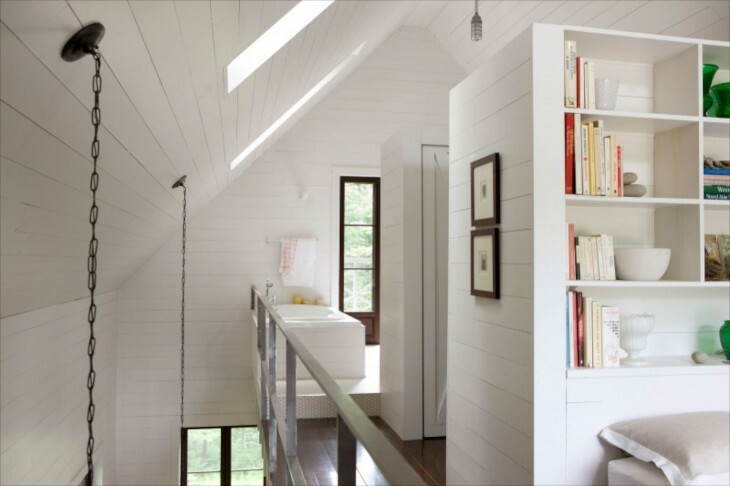 This getaway home has the lines of a classic New England saltbox home. It is 1900 sq ft in size. 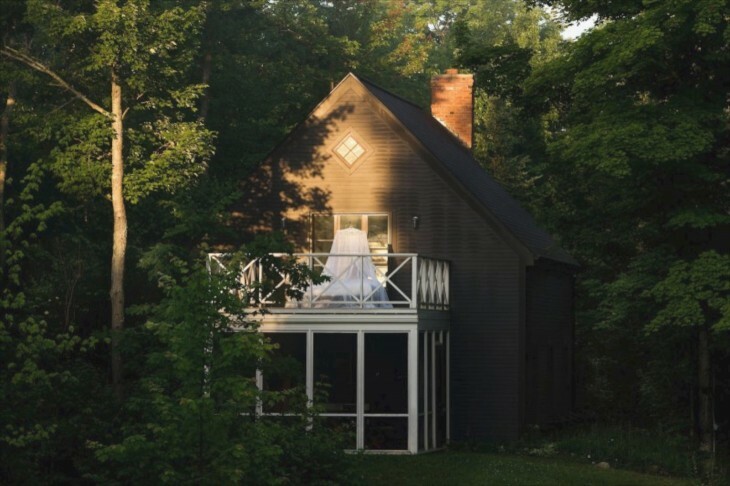 The photographer, who photographs the interiors of homes for a living, spent $250,000 (Canadian) to build the home including clearing and efforts to preserve the trees. The interior is painted in high gloss white paint, which keeps the interior bright. 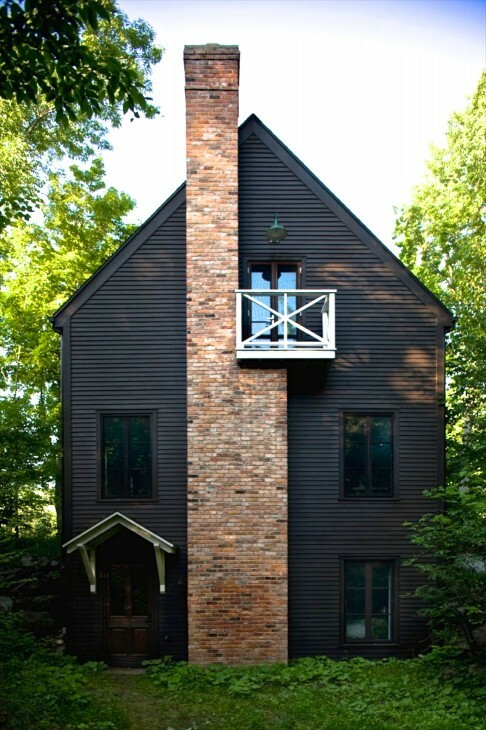 A nice contrast to the dark, deep rich exterior house color. 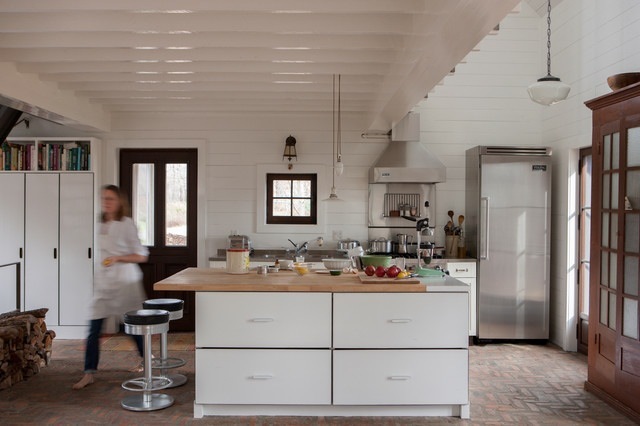 The beautiful brick floors are heated for comfort in the cold winters. 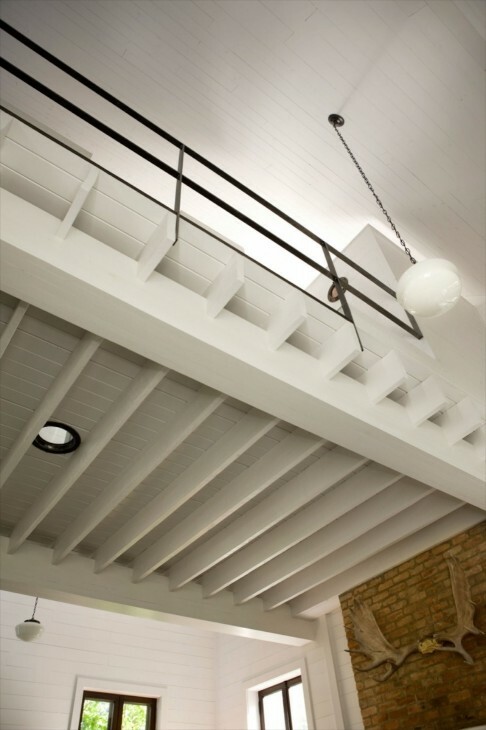 The beams add dimension. 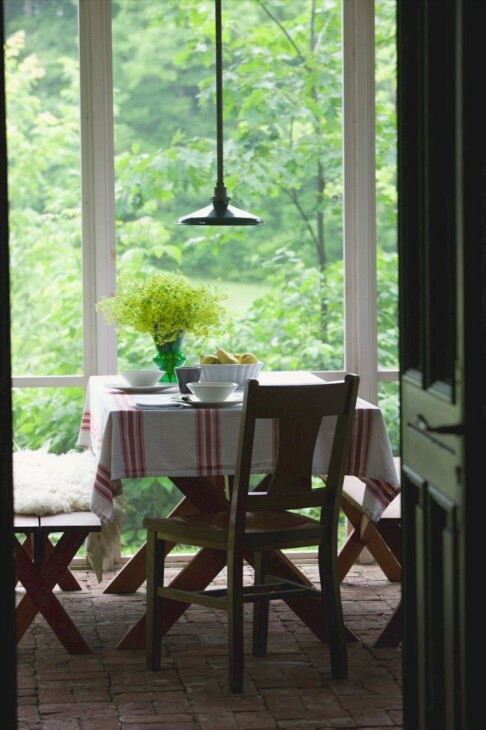 .French doors allow easy access to the outside. Deep drawers in the island offer easier access and I think hold more items for the ready. Large amounts of storage, visible to the left in the tall cabinets. The table is oak, and Longpre found it at an antique store. He custom designed the benches. The beautiful cabinet was found in the same antique store, and is visible in the above photo as well. 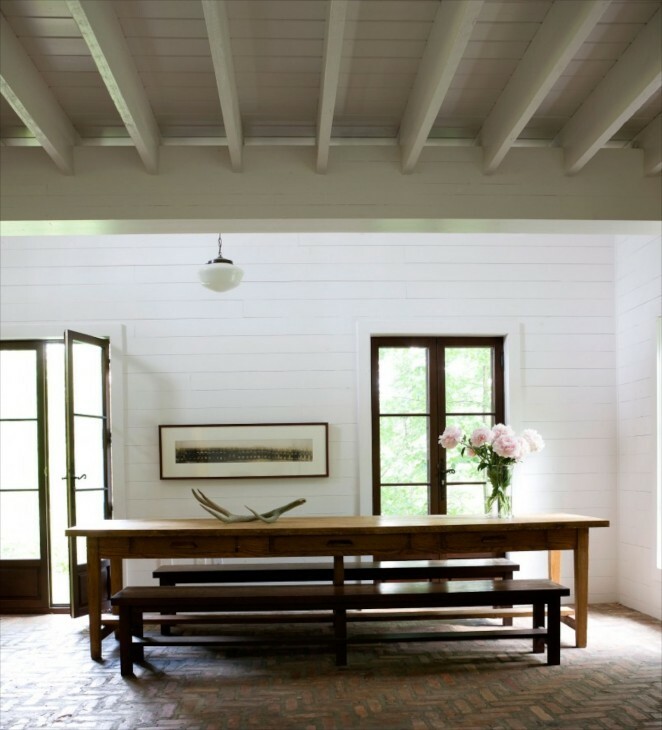 There is an elegant simplicity to this room despite the rustic materials. 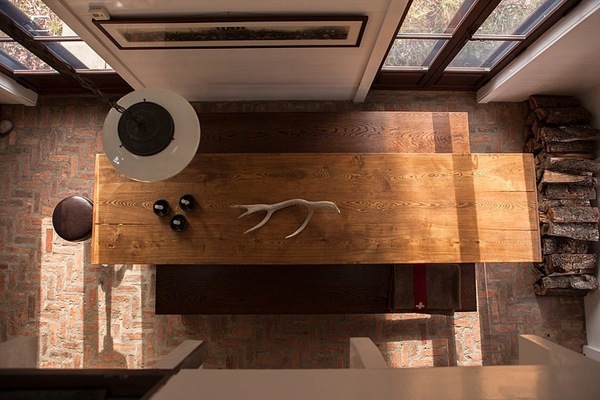 Looking down into the dining room onto a beautiful solid wood table top. 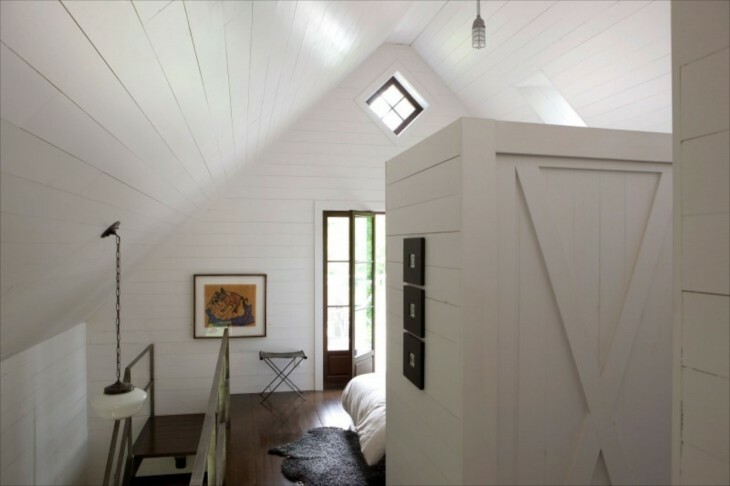 The high lofty interior helps the home seem much larger than it’s modest size. 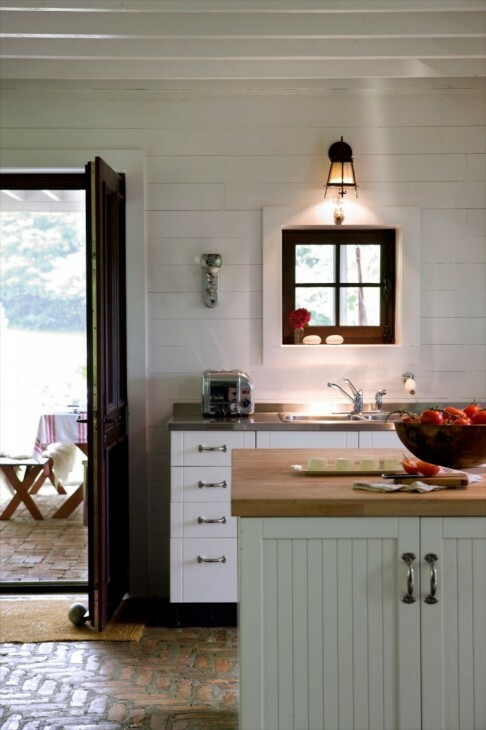 Abundant windows and doors allow light to flood the home as well as providing easy access to the outdoors. View of the porthole in the floor of the loft area. An unusual way to use one, but it adds character! 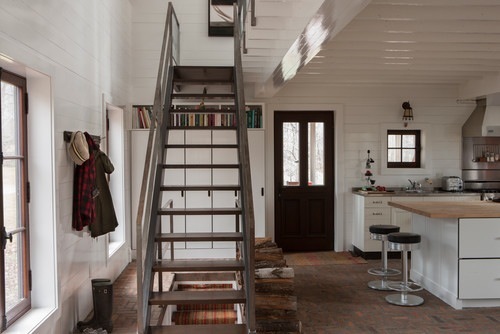 Open stairs add further to the open feeling of the home. 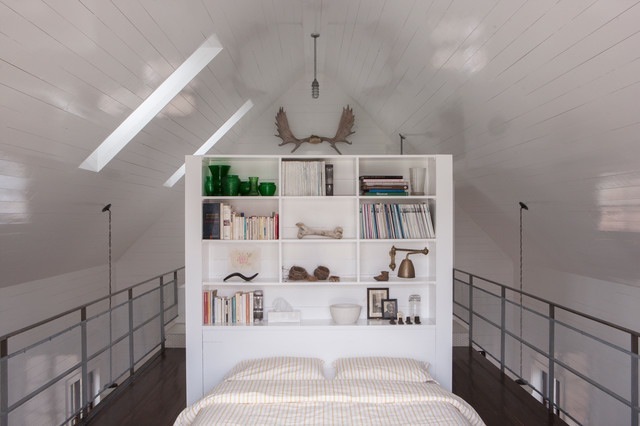 The back end of the headboard is actually a elk in closet, and past that is the bathroom. 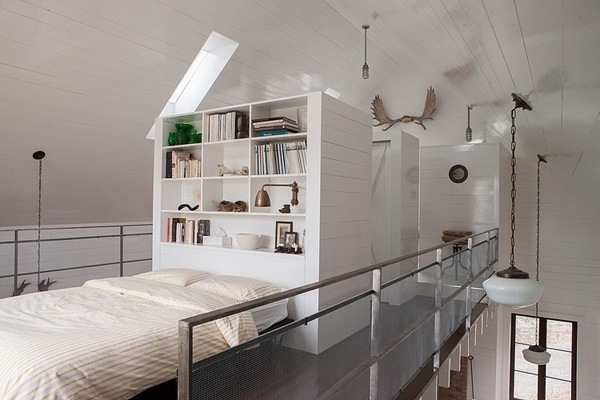 The sky lights flood the loft area with natural light. The bed is on casters so that in the summer, he and his wife can open the french doors and wheel the bed to the outside and sleep under the stars. 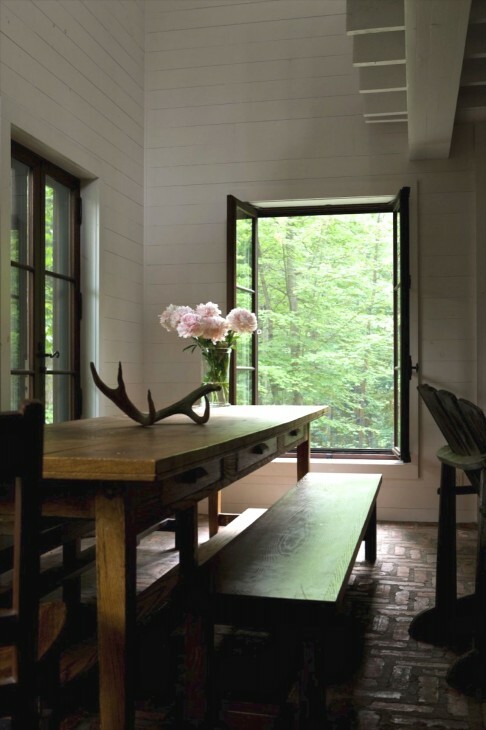 Love the window above the french doors. 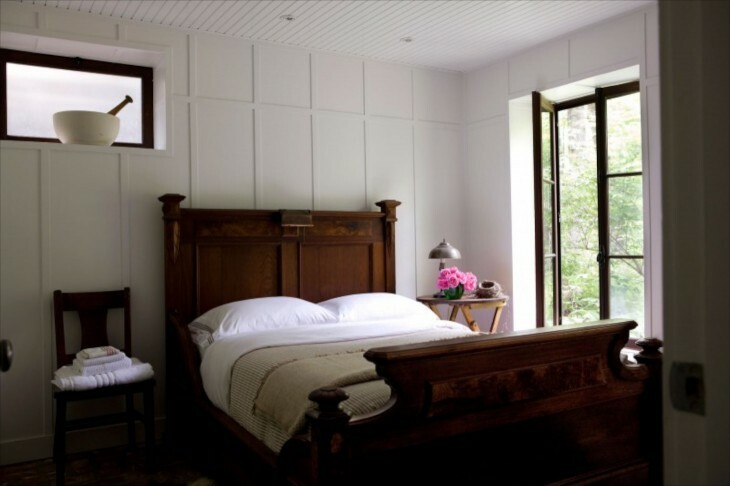 The guest bedroom is on the lowest level and like the other rooms has access to the outside, which was a priority in the design. The floor is varnished red pine. 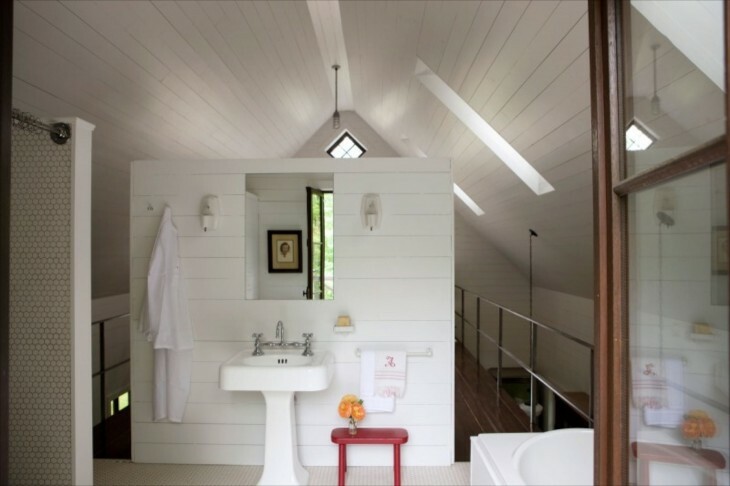 The bathroom floor is raised and covered with white penny tile. 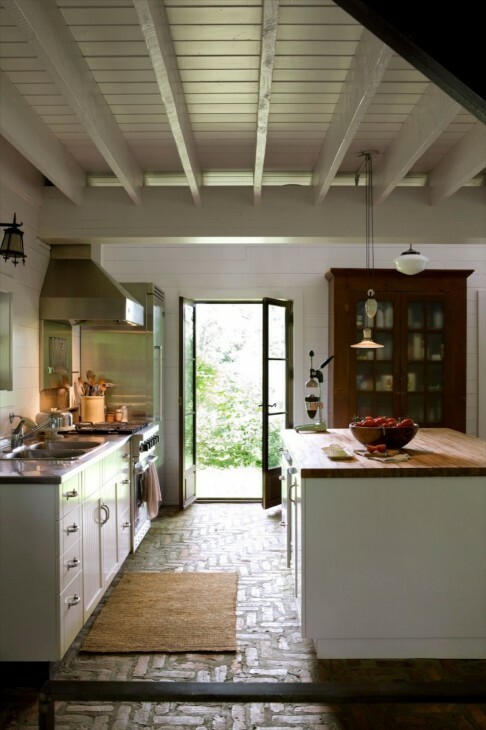 Opposite the sink are french doors and a small porch area. What a nice way to start the morning. 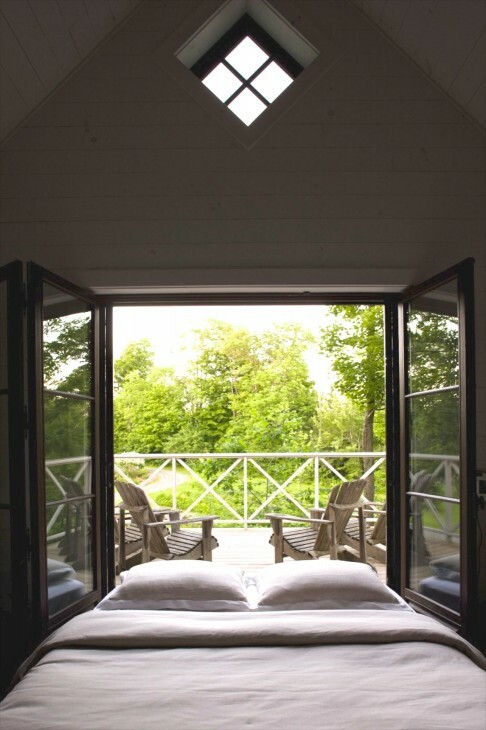 The porch allows comfortable summer breezes minus any bugs, while also protecting from the elements. 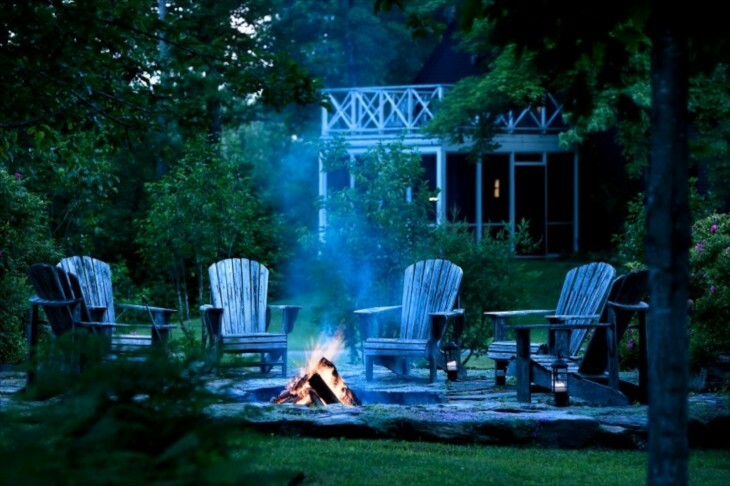 What an inviting place to sit, enjoying the fire pit and the company of each other and friends. 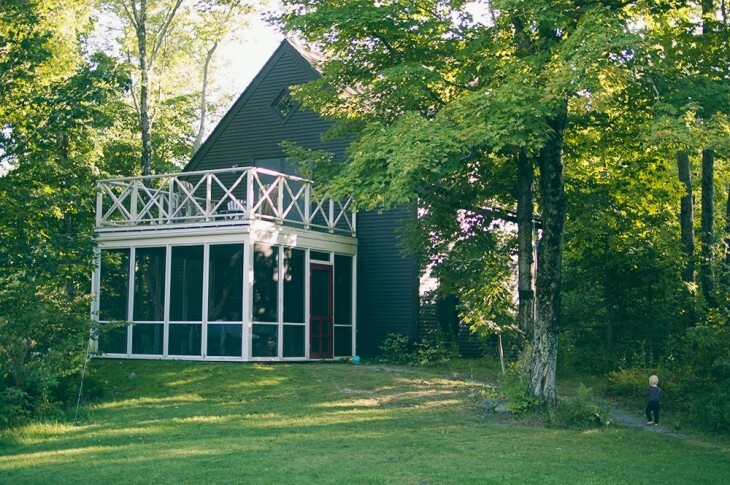 Thanks Laurie, As I replied to another commenter, it is not my usual house, but something intrigued me about the use of space and the contradiction between the outside and the inside. 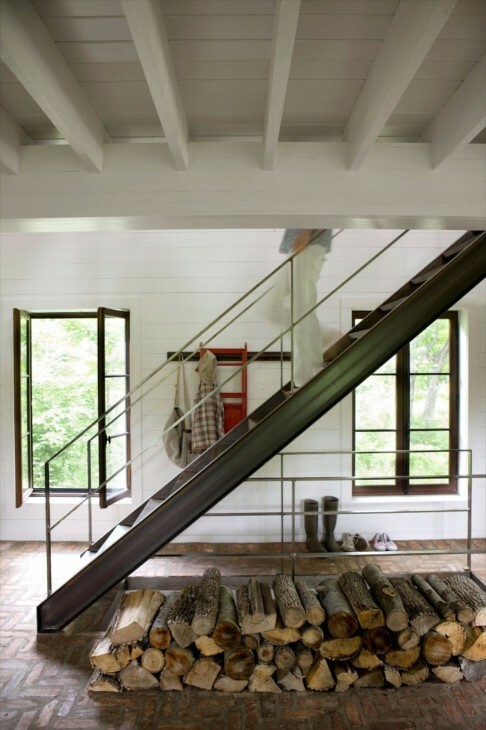 I really like how he us the materials in a clean, comfortable yet quite modern and minimalist way. I year to be a minimalist, but it is never going to happen, in this lifetime anyway. I admire those who achieve it and maintain it. 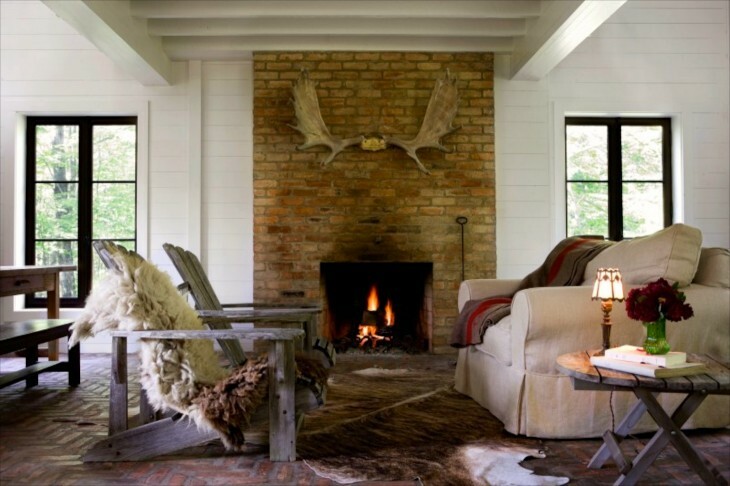 Great retreat…..Love the mix of all the different styles…just enough of each to make it personal.